Statt 44,50 € nur noch 26,-- €! 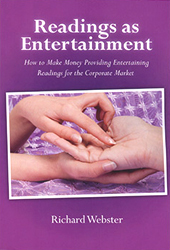 How to Make Money Providing Entertaining Readings for the Corporate Market. You can enjoy a lucrative part-time or full-time career as an entertainer who provides brief readings for clients and guests at corporate events. In this book, Richard Webster, who has worked in this market for almost thirty years, shares with you all the secrets he has learned about this little known, uncrowded, and lucrative market. Richard Webster is the author of more than 90 books, 28 of them for the mentalism market. Richard has enjoyed a varied career, including periods as a mentalist, stage hypnotist, magician, psychic reader, and pitchman. He has appeared on Hard Copy, 20:20, and the Mike and Maty Show. In 2007, the Psychic Entertainer's Association presented him with The Dan Blackwood Award for his "outstanding contribution to the art of Mentalism. Englischsprachiges Buch, kartoniert, Format 15 x 22 cm, 115 Seiten.